The 911 has a formidable rally legacy of course and now there's a new one to continue that tradition, as last week Porsche rallying specialist Tuthill gave its brand new 997 RGT rally car a shake down following approval of 'modern' 911s for WRC competition. The Harry Flatters rally was chosen for its debut, although the RGT only ran as the course car on its initial test. Organised by the Brecon Motor Club, the Harry Flatters is a true test of nerve - the clue being in the name. Run over miles of military land and on roads with straights that just go on and on until they fade into the horizon, the vast expanses of Tarmac "encourage a flat-out throttle pedal - hence the name - with the quickest sections littered with hidden dips and junctions, all designed to catch out the unwary, with potentially disastrous results." No pressure for the 997 RGT's first public outing then. We've seen GT3s rallying in the modern era, most notably campaigned by Belgian legend Marc Duez at the Monte last year. 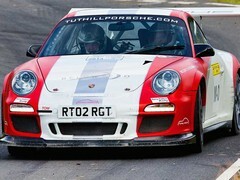 However, he piloted a 996. According to Tuthill, "It's taken a determined effort by our team to get FIA approval for a modern 911 in current WRC rallying, but we're delighted to have finally accomplished this. Now that the door has been opened, the prospects offered by a Porsche 911 RGT rally car are incredibly exciting and nothing beats live stage rallying, so we just can't wait to try it." 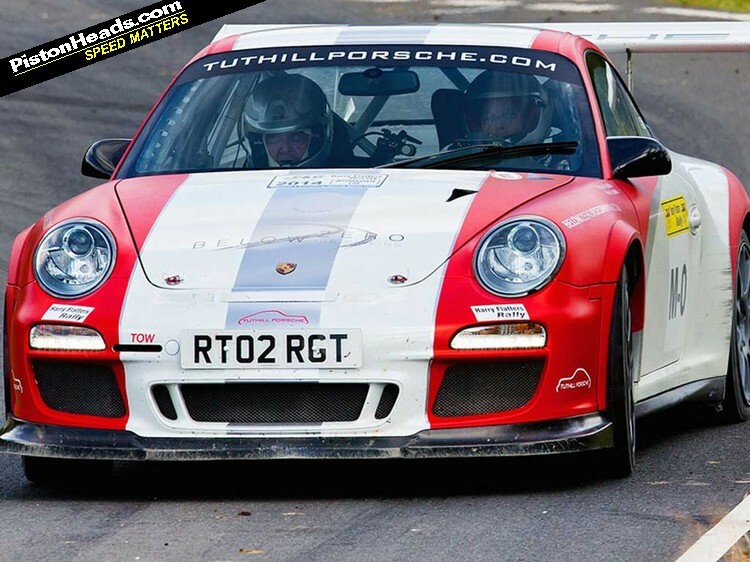 The shakedown went well, with Richard Tuthill of - you guessed it - Team Tuthill Porsche commenting, "The team has done a magnificent job. The car lands beautifully from jumps, is incredibly nimble through the narrow tight twisty stuff and hugely competent in the fast sections. It was born to rally!" 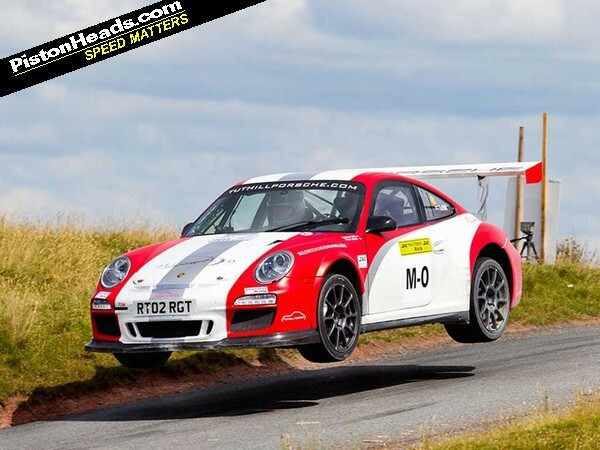 And if you've seen that vid of Harris riding shotgun with Francois Delecour in a road going GT3 RS, you'll know what real rally drivers think of the car. The first chance the team will get to show the RGT on the world stage will be at the next WRC round in Germany. Although it could have competition, as a rally-prepped 997 GT3 actually took to the start line of rally Finland last weekend - those speeds on that surface with an inevitable huge amount of oversteer we'd like to witness. Now, with the old WRC RGT class homologation rules out and 'technical vehicle passports' in, it should encourage more GT cars to take to the loose. We hope. Enjoy that flat-six howl and a few airborne moments in the vid. I would love to see a rally prepared Nissan GTR doing battle on the offroad track. Probably too big and heavy mind. A rally? That is what we call a sunday drive on the Essex countryside back roads. I live just round the corner from these guys. It's great, I get to see all manner of amazing porsches hooning about. This is what (international) rallying needs. More aspirational performance cars that at least seem similar to what you could buy in a showroom and less dull superminis in unrealistic configurations.